The monthly data for July released last week was almost all quite positive. Retail sales, industrial production, capactity utilization, and housing permits all rose quite strongly. Consumer sentiment rose slightly. As a result of permits, the Conference Board's Leading Index increased, exactly reversing June's decline. Consumer prices did not rise at all. Producer prices rose +.3. The only significant negative news was that both the Empire State and Philly regional manufacturing indexes both contracted. I report on high frequency weekly indicators because they are as close as we can reasonably get to observing economic trends in real time. Turns will show up here before they show up in monthly or quarterly data. Recently I've been focusing on consumer purchases and the effects of the Oil choke collar as the keys to the economy for the second half of this year. The ICSC reported that same store sales for the week ending August 11 fell -0.3% w/w, but rose +3.6% YoY. Johnson Redbook reported a 2.0% YoY gain. Shoppertrak did not report. The 14 day average of Gallup daily consumer spending as of August 16 was at $78, $7 over last year's $70 for this period. This is the third week of real strength after six weeks in a row of weakness. This is very encouraging but we will still have to see if consumers are regaining their footing. On the other hand, the energy choke collar has now re-engaged, while there is some enocuraging news agout gasoline usage. Gasoline prices rose yet again last week, up $.07 from $3.65 to $3.72, and are now higher than a year ago. Oil prices per barrel also rose for the week, from $92.87 to over $95.. Gasoline usage, at 9308 M gallons vs. 9195 M a year ago, was up for a change, +1.3% The 4 week average at 8907 M vs. 9163 M one year ago is off -2.8%. August last year is when the precipitous YoY declines in gas usage began to be registered. That we have a positive 1 week YoY comparison is encouraging, but it must continue to not signal further weakness. Employment related indicators were mixed this week. The Daily Treasury Statement showed that for the first 12 days of August 2012, $85.0 B was collected vs. $85.1 B a year ago. For the last 20 days ending on Thursday, $131.6 B was collected vs. $126.1 B for the same period in 2011, a gain of +4.3%. The American Staffing Association Index held steady at 93. This index was generally flat during the second quarter at 93 +/-1, and has returned to that level after its July 4 seasonal slump. It nevertheless is not rising from that range and so indicates significant weakness. Weekly BAA commercial bond rates rose another .09% to 4.89%. These remain close to the lowest yields in over 45 years. 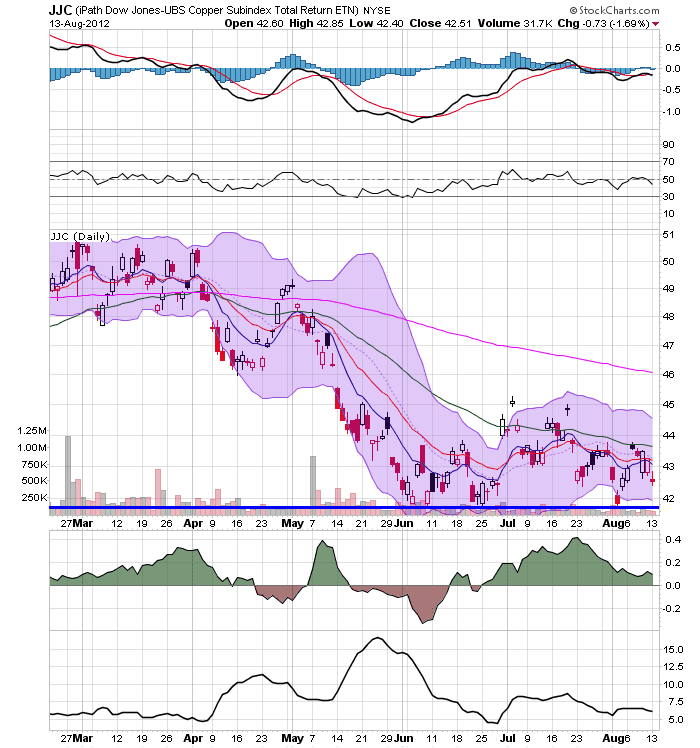 Yields on 10 year treasury bonds also rose 0.11% to 1.65%. The credit spread between the two declined to 3.24%, which is about halfway between its 52 week maximum than minimum, and a significant improvement from one month ago. Tightening credit spreads are a good sign. The Mortgage Bankers' Association reported that the seasonally adjusted Purchase Index declined -2.0% from the week prior, and were also down -4.9% YoY, back into the lower to middle part of its two year range. The Refinance Index fell -5.1% but is still near its 3 year high. The Federal Reserve Bank's weekly H8 report of real estate loans this week rose +0.8% for the week. The YoY comparison rose to +1.2%. On a seasonally adjusted basis, these bottomed last September and are also up +1.3%. YoY weekly median asking house prices from 54 metropolitan areas at Housing Tracker were up + 2.3% from a year ago. YoY asking prices have been positive for over 8 months. M1 was off -0.6% last week, and was flat at 0.0% month over month. Its YoY growth rate fell from +13.9% to +10.7%, as comparisons with last year's tsunami of incoming cash are in full progress. As a result, Real M1 declined to +9.3%. YoY. 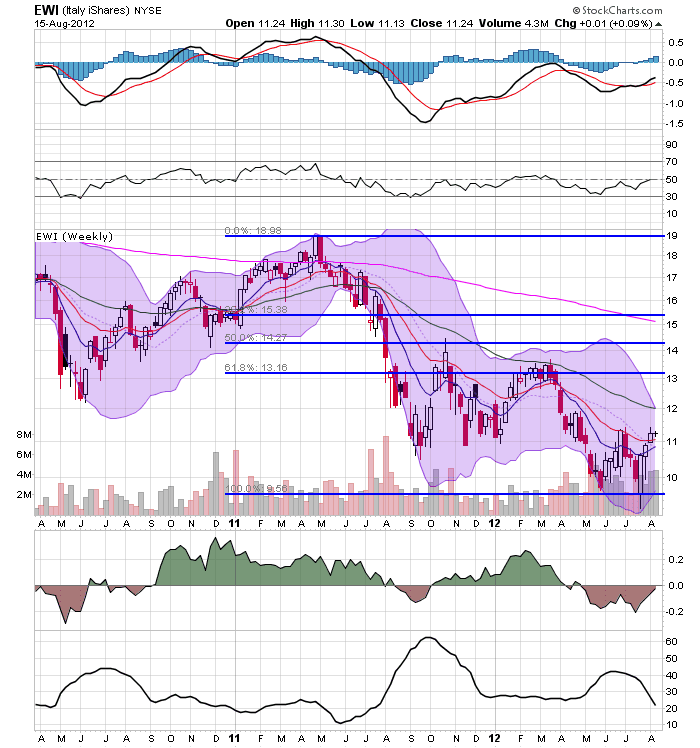 M2 fell -0.2% for the week, and was up 0.3% month/month. Its YoY growth rate fell from 7.4% to +6.5%, so Real M2 grew at +5.1%. Real money supply indicators are now declining as the tsunami of cash arriving from Europe last summer disappears from the comparisons. The American Association of Railroads reported a +0.8% increase in total traffic YoY, or +3,800 cars. Non-intermodal rail carloads declined -1.2% YoY or -3,800, once again entirely due to coal hauling which was off -7,300. Negative comparisons rose back from 6 to 8 types of carloads. Intermodal traffic was up 7,400 or +3.2% YoY. 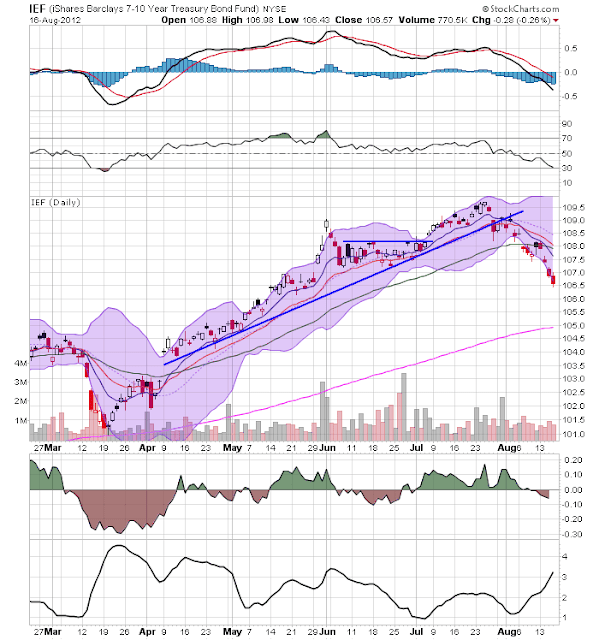 The TED spread rose from its 52 week low of 0.34 to 0.37. The one month LIBOR declined to 0.237, an 111 month low.. It remains well below its 2010 peak, and has still within its typical background reading of the last 3 years. Even with the recent scandal surrounding LIBOR, it is probably still useful in terms of whether it is rising or falling. The Baltic Dry Index fell from 774 to 714, only 44 points above its February 52 week low of 670. The Harpex Shipping Index fell another 2 points to 398. It is up only 25 from its February low of 375. Finally, the JoC ECRI industrial commodities index fell from 119.10 to 117.89. This is still near its recent 52 week low. YoY comparisons for this number will shortly improve (or get less worse) as its August 2011 swoon will leave the comparison period. Nevertheless, its decline remains a strong sign that the globe taken as a whole has been slipping back into recession. Like the positive monthly indicators for July, most of the weekly indicators were at least slightly positive this week, including sales, the 4 week average of jobless claims, the 20 day sum of withholding taxes paid, credit indicators, housing prices and real estate loans, and money supply. The most significant negative is gasoline prices which have risen back into the choke collar zone. Mortgage applications declined. Staffing services were weak. Global indicators of shipping and industrial metals prices continue to indicate a downturn. By continuing to expand moderately, the US remains the world's least worst economy. Three years ago I was arguing with Doomers on Daily Kos who thought that, as awful as things were, they were only going to get worse and worse as we fell into the bottomless abyss, quoting Zero Hedge and The Automatic Earth as gospel scripture that we were going to 25% unemployment and 1000 on the Dow Jones Indsutrial Average. Since then, I've countered the double-, triple-, and quadruple-dippers who have mistaken every spring slowdown for vindication. Over the last 9 months or so, I seem to have become the poster child for disagreeing with the very prominent forecasting firm ECRI, who thought we might already be in a recession, or one was "right in front of us," almost 1 full year ago. I stand by all of those calls, because that's what the data showed me. But pointing out that the economy isn't actually contracting is a far different opinion than believing the economy is in anything remotely close to good condition. It isn't. It's in terrible condition, and all its advances grow more and more precarious as time goes on. In a liberal democracy like the US, the desiderata of the economy ought to approximate the greatest good for the greatest number. Instead, for possibly as long as the last 40 years, but certainly since 2000, a majority of Americans have almost certainly fallen behind, a condition that looks ever more chronic as wage growth declines to 0% YoY. A defaltionary wage and debt spiral becomes a greater and greater possibility, even if its timing is not yet known. It is simply not good enough that the economy is growing. 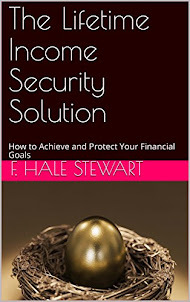 Real income growth is paltry. Job growth is mediocre at best. The plutocrats and the banksters -- generally, the creditor class -- have been made whole or at least kept afloat via bailouts. Debtors have been left to fend for themselves. That is a recipe for not just months or years of malaise, but possibly decades. 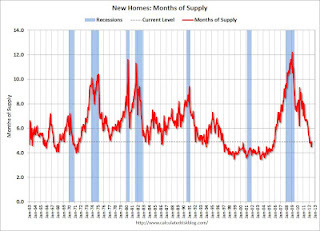 Supply does not create its own demand. Yes, efficient new goods will find markets. But otherwise we need growing demand to justify expansion of supply. Unless and until the well-being of the shriveling American middle class is placed front and center, there will be no full recovery. While the Doomers have been wrong at every turn for the last three years, there should be no mistaking the fact that simple growth in the economy is simply not good enough. The global economic weakness that has intensified as this year has progressed has greatly tamped down inflation. If wages were growing at a reasonable rate, this would help jump-start demand. Per my past postings, if inflation bottoms out at that point, that should mark the low point of the recent weakness. But we are getting ever closer to the point where wage stagnation rolls over into actual wage deflation. The entire treasury curve continues its move lower. 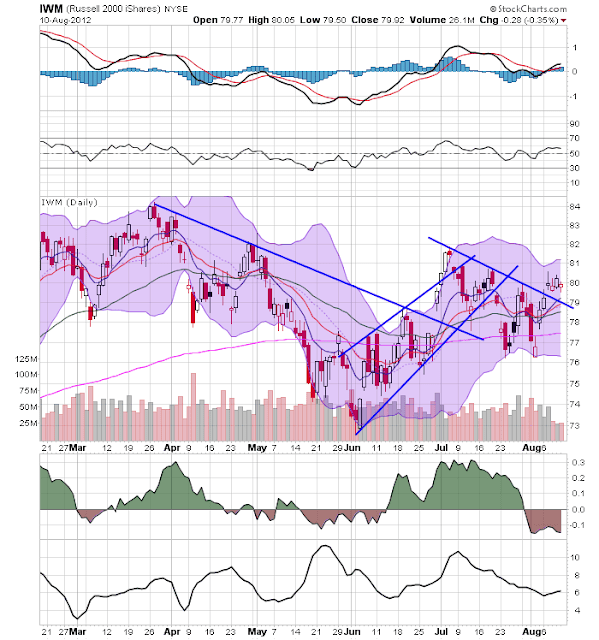 All sectors have broken upward sloping tend lines and have bearish MACD formations. Money is flowing out of the markets and volatility is increasing. The next logical target is the 200 day EMA on the TLTs. The SPYs have moved to a six month high. Momentum is rising, the EMA picture is bullish and money is moving into the market. The QQQs are approaching a 6 month high. 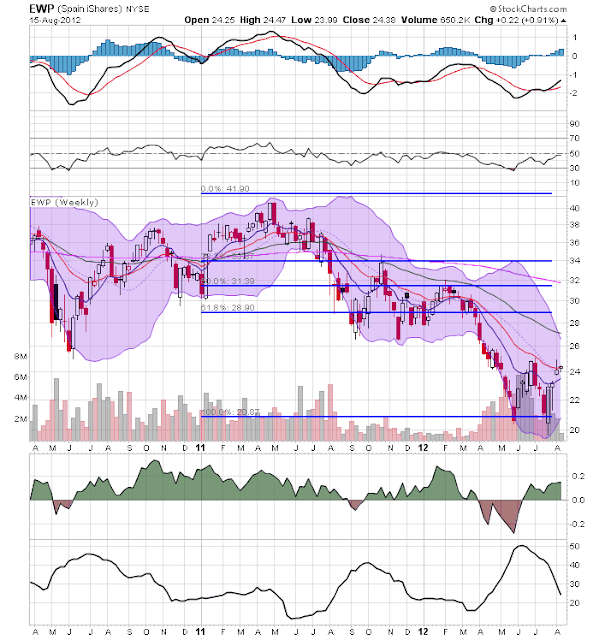 The IWMs are still weak, but yesterday's price action eases the negative reading. 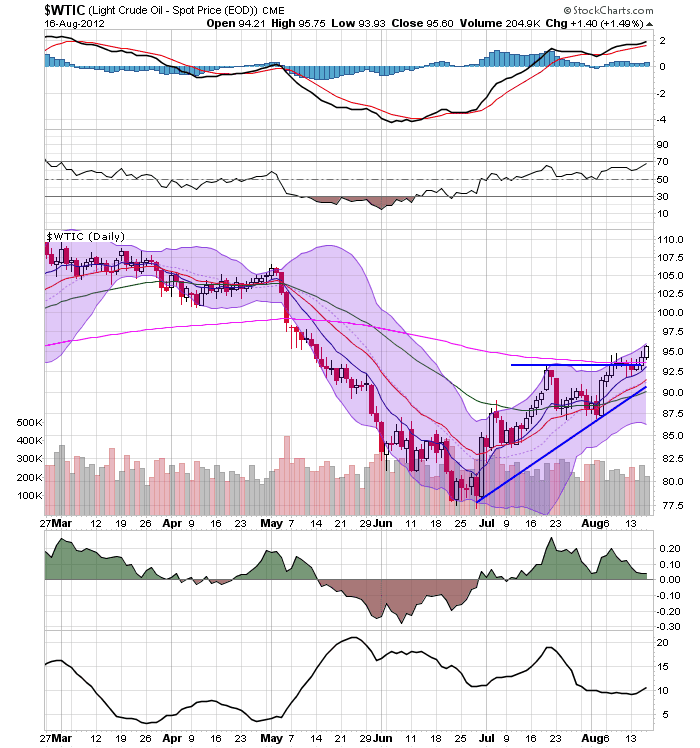 The EMAs are moving higher and momentum is positive. But the CMF is still negative. Ideally, we'd like to see a stronger move in this market to confirm the rally. 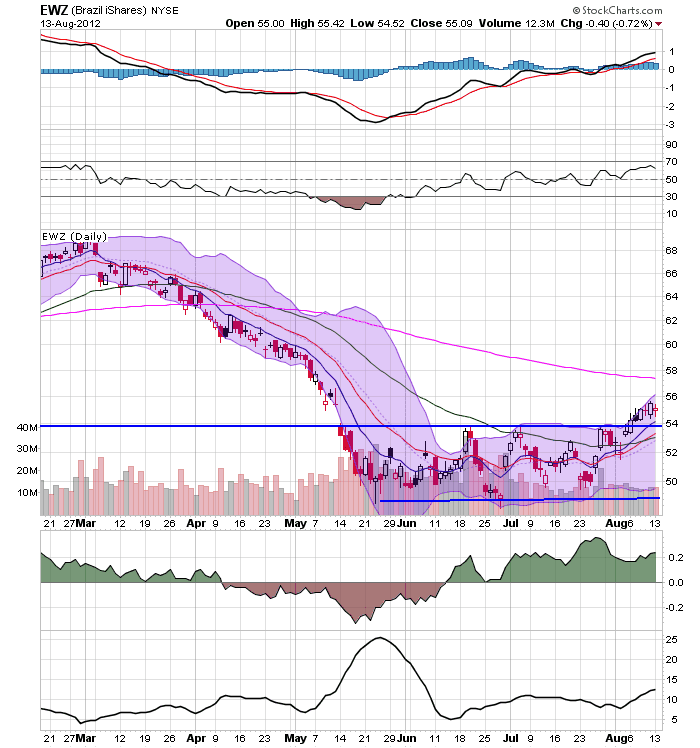 Oil has broken out from its consolidation. The price target is 100 (lows that were established in early April). Two piece of economic data released this morning make it considerably harder for bears to argue that we are slipping into, let alone already in, a new recession. You can see that permits lead spending, which in turn leads construction employment. Needless to say, the rise in permits is bullish for both residential construction spending and future employment. No recession has ever begun within 2 months of such a reading. There are certainly major problems with the expansion, most notably the plateauing of consumer retail spending since this year began, and the complete stalling and perhaps slight contraction in manufacturing. But this morning's releases put an exclamation point on the proposition that the expansion hasn't expired yet. We now know the values for July for 3 of the 4 indicators that the NBER uses to mark economic peaks and troughs. Nonfarm payrolls were reported up 163,000 for the month. Further, their YoY growth has been acceleratiing slightly a compared with earlier this year. The YoY growth has decelerated slightly. The final coincident indicator, real income, won't be reported for another couple of weeks. Barring downward revisions, however, it seems likely that the economic expansion continued in July. The weekly Spanish chart shows the market may be making a bottom. First, notice the depth of the sell-off; prices moved from 40 to about 21 for a drop of almost 50%. However, prices have twice attempted to sell-off to the 20/21 area. Also note the first sell-off was done on much higher volume than the second. 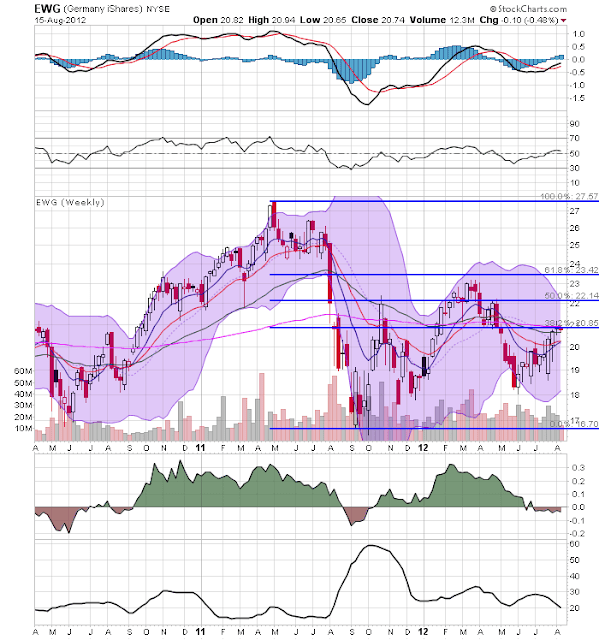 The Italian market is in a similar situation as the Spanish market, but the above chart has a less clear double bottom signal. There is a heavier volume picture, but it's not as clear-cut as the Spanish market. 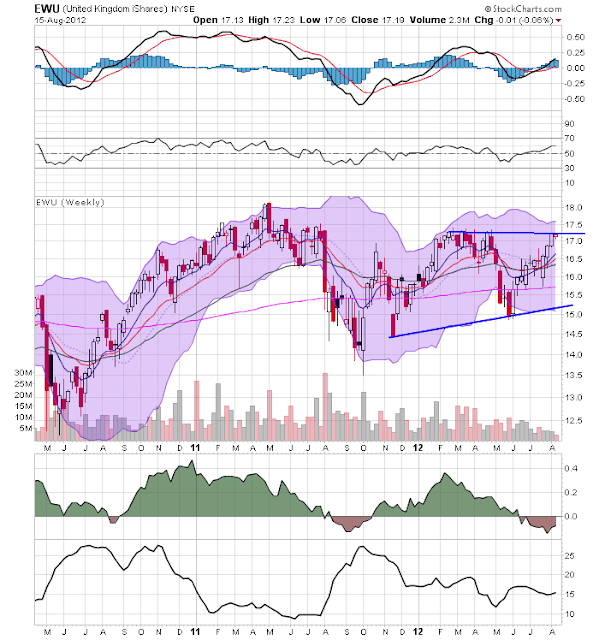 The weekly chart of the British market shows that -- despite three quarters of contraction -- the market is actually consolidating in an ascending triangle pattern. While the British economy is weak (they've had three quarters of contraction), it has benefited from capital inflows as a result of its haven status. The weekly chart of the French market shows that prices have been consolidating in a sideways pattern for nearly a year. The weekly German chart has no pattern. However, prices are right at the 200 day EMA and are in the middle of a multi-month rally. 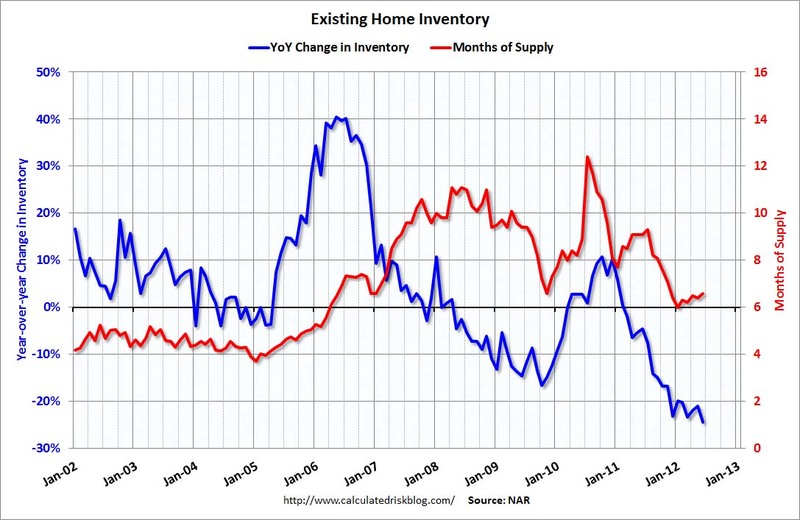 Let's continue our look at the possibility of a second half rebound by looking at housing. 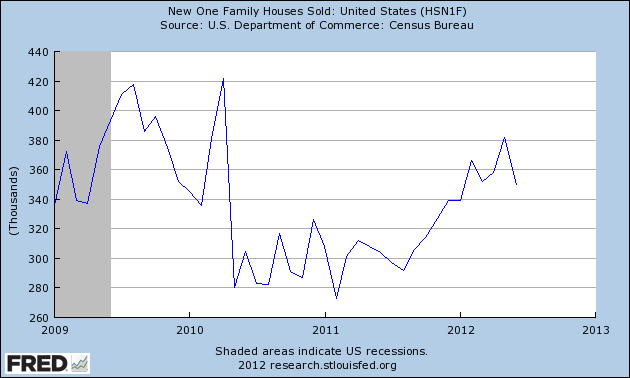 We'll first look at new home sales, which account for a small portion of the real estate market. Note the increase over the last 9 months, where we see an increase form a ~300,000 annual pace to an ~360,000 pace. 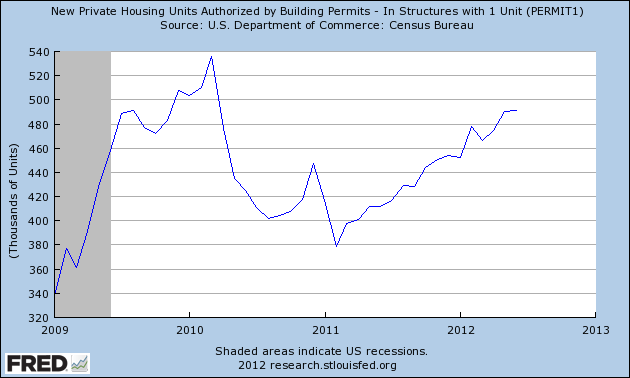 Building permits for i-unit structures are clearly increasing, and have been for about a year and a half. 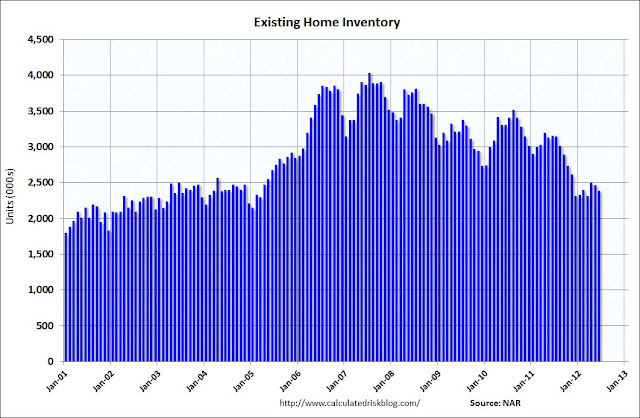 Let's turn to the existing home market. The overall sales sales pace has been pretty constant for the last two years. Notice that this is in line with the historical norms of the early 1990s. and absolute amount of inventory measurement. 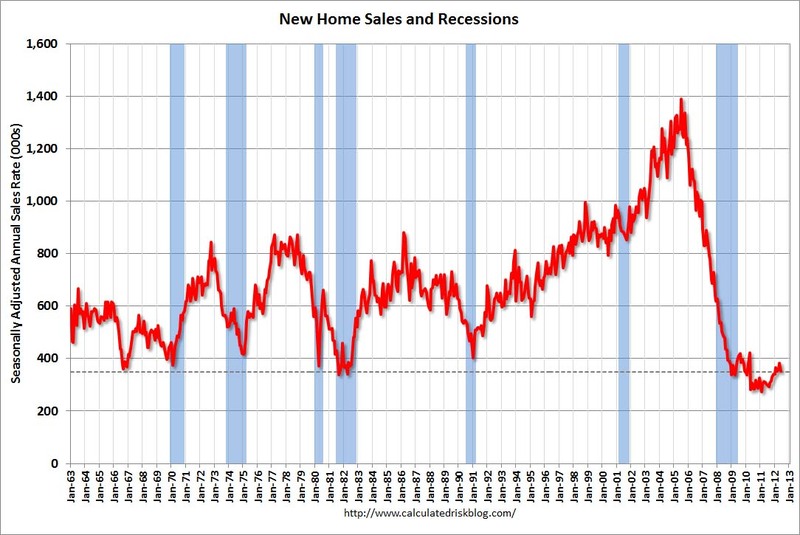 Home prices rose for the fourth month in a row in May, suggesting the recovery in the housing market continued to gain traction, even as the broader economy wobbles. The S&P/Case-Shiller composite index of 20 metropolitan areas gained 0.9 percent in May from April on a seasonally adjusted basis, topping economists' expectations for a 0.5 percent gain. "Real estate continues to show improvement off the bottom. That's one of the few encouraging signs we've seen," said Subodh Kumar, an investment strategist at Subodh Kumar & Associates in Toronto. 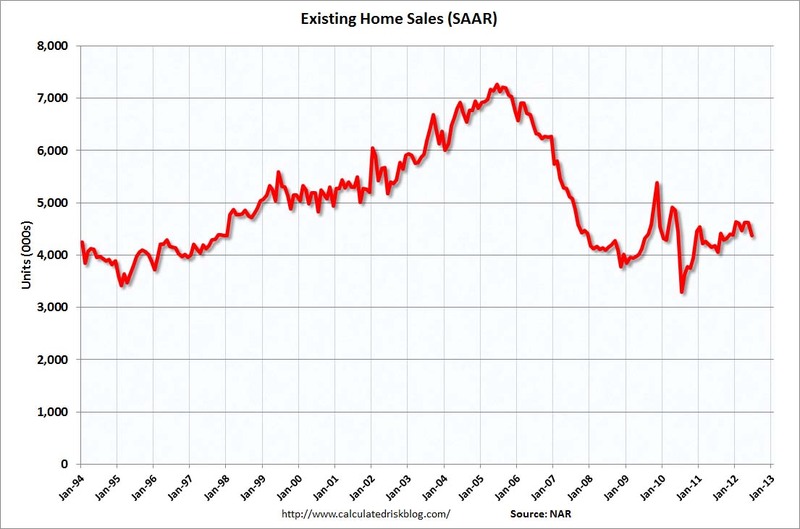 On a non-seasonally adjusted basis, prices fared even better, jumping 2.2 percent. Compared to a year ago, price declines moderated to slip 0.7 percent, the smallest drop since the last time year-over-year prices rose in September 2010. 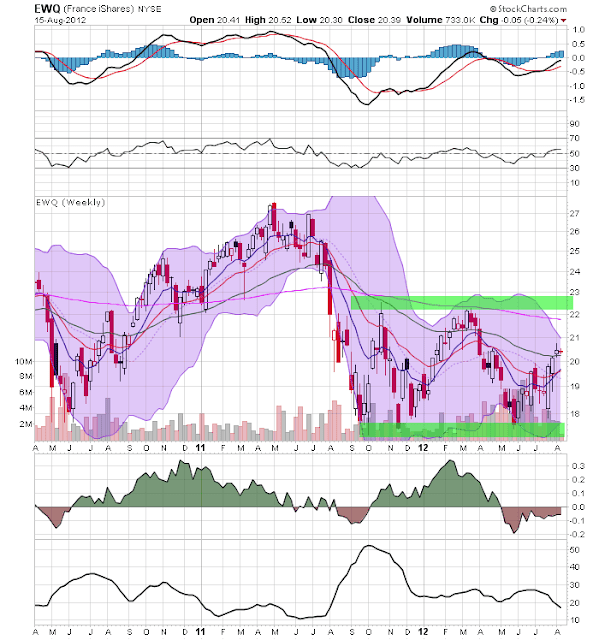 The entire grains complex is still at elevated levels. 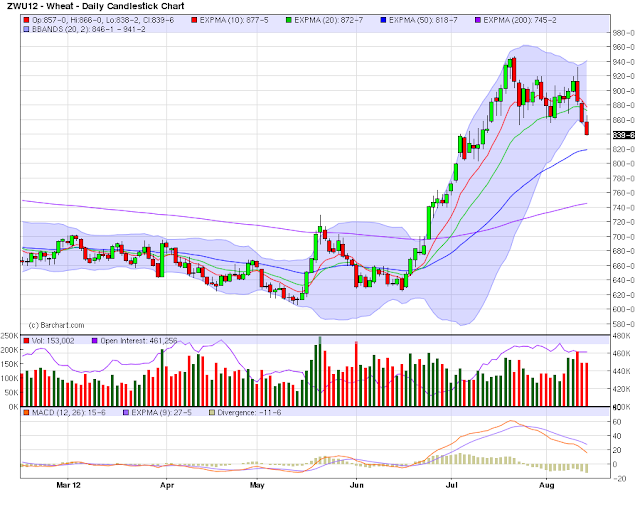 Corn and soybeans are still trading in a sideways pattern while wheat has moved lower, with prices targeting the 50 day EMA. 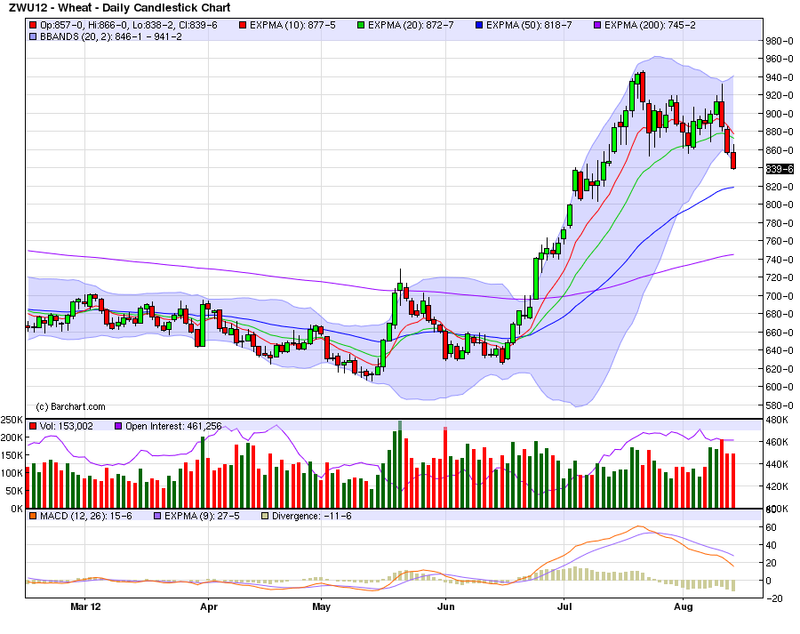 Considering the USDA recent downgraded the US crop estimate again, I would use the sell-offs as a buying opportunity. The euro is in a downward sloping channel, largely as the result of the economic events in the region. While we see two counter-trend moves -- one in June and another from mid-July to mid-August -- the overall trend is still lower. With the EU printing a negative GDP report, expect this trend to continue. Last week, the Washington Post ran an article titled, Economy Might Be Gaining Traction, New Data Suggest. The article highlights recent developments in exports, housing and employment as the reasons for enthusiasm. This week, I'm going to look at some of the points made in the article to see if they're valid. 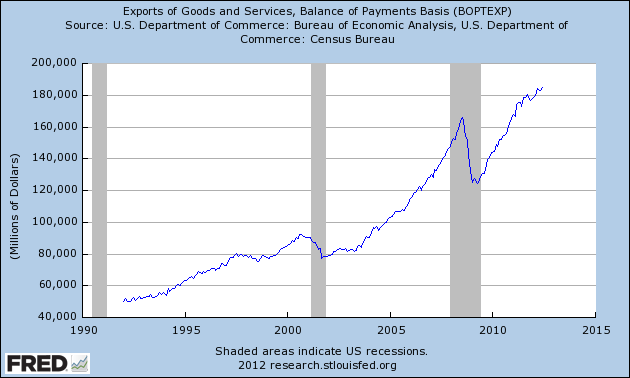 The above charts shows total exports on a balance of payments basis. 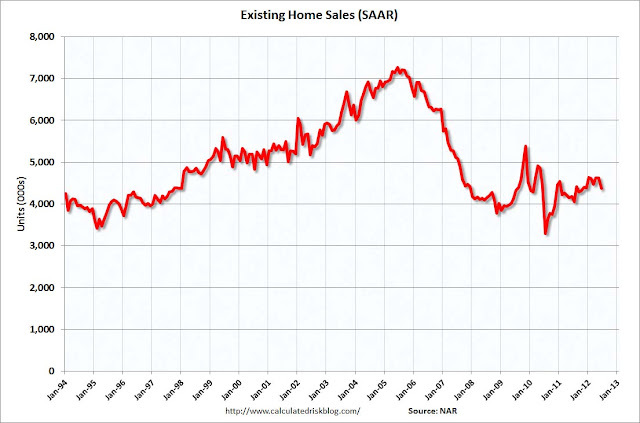 As clearly evidenced by the data, this has been one of the bright spots of the recovery. 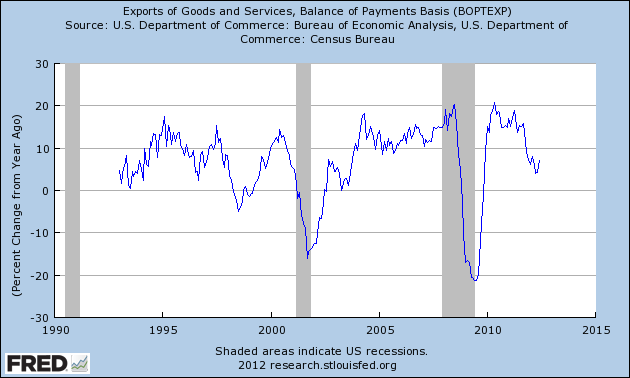 US exports rebounded from the recession and have been growing for the last few years at a strong clip. However, the year over year percentage change chart shows a clear slowing down of the pace of increase. Part of this is due to the very favorable comparisons that occurred at the beginning of the recession -- when exports contract 20% in the previous year, it's easy to make the annual comparison look good. However, there is no mistaking that the pace of expansion is slowing, largely because the rest of the world is slowing down. Also consider that exports only account for 14% of GDP, so the multiplier associated with this sector would have to be quite large for it to have the power believed by the article's author. Finally, I don't think we'll be seeing a big pick-up in world-wide growth anytime soon, so I'm not sure this is a surefire reason to get excited. 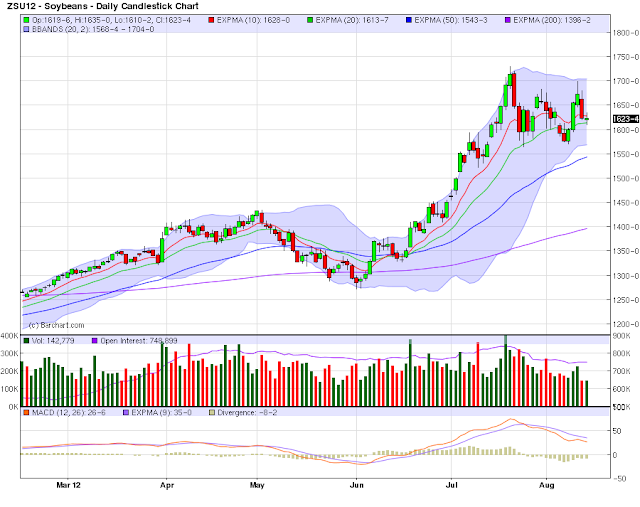 After moving through upside resistance, the Chinese market hit the 200 day EMA and has since sold off to the 10 day EMA. 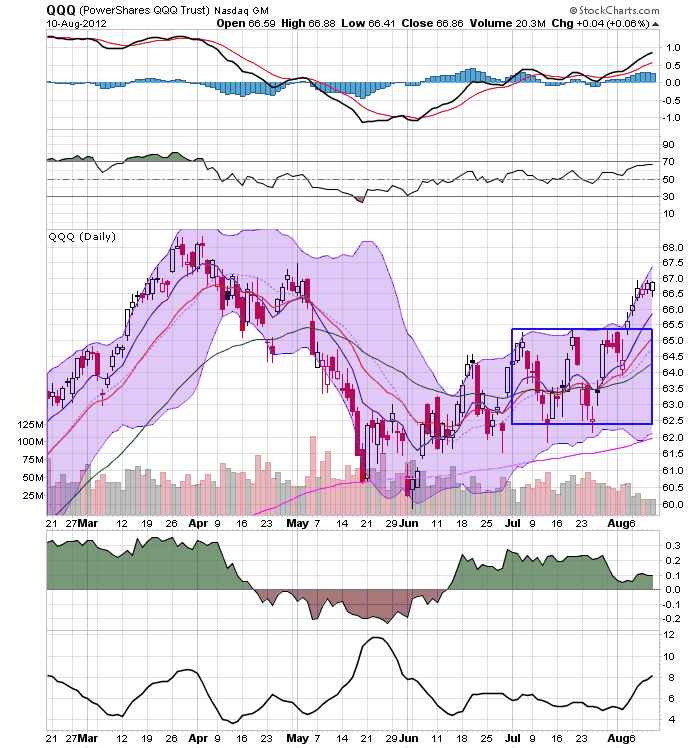 However, the price bars on the chart are quite moderate; they look like a standard, profit-taking sell-off rather than a panic sell. Also note the underlying technicals are still solid: the MACD is rising, the CMF shows money flowing into the market and the RSI is higher. 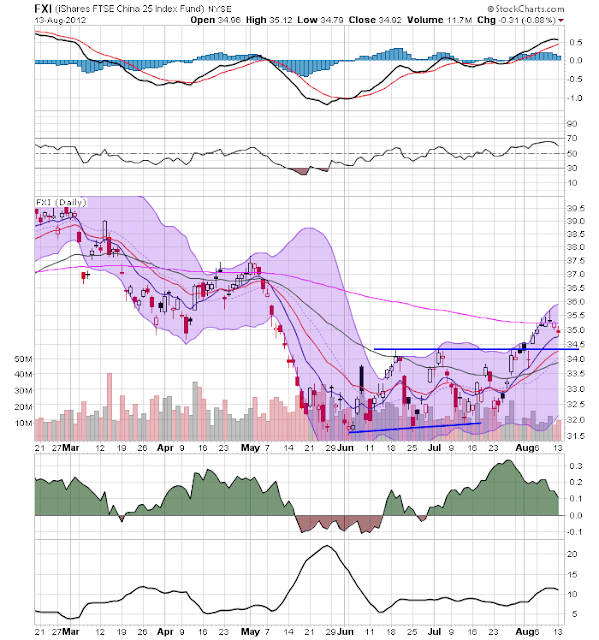 The Indian market is still under the high established at the beginning of July along with the 200 day EMA. Also note that prices have been moving sideways for the last week, hitting support at the 10 day EMA today. 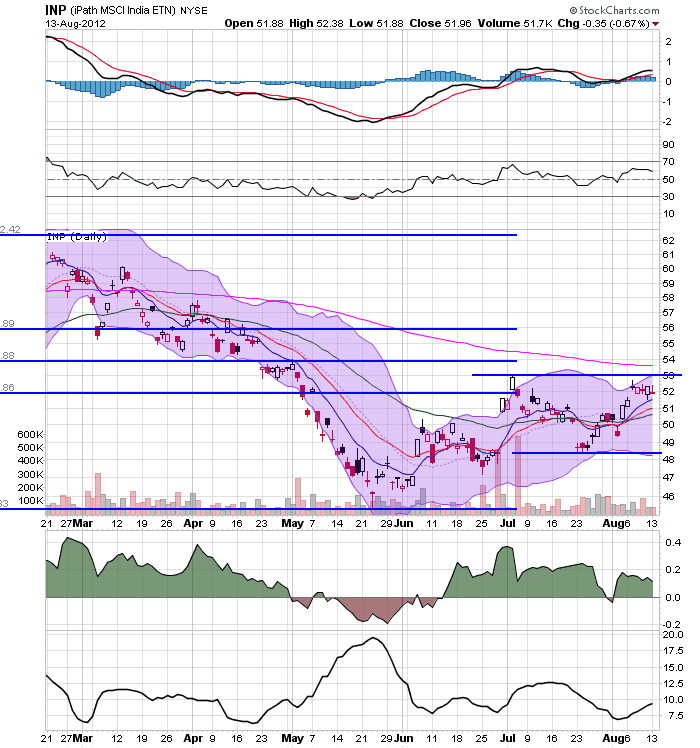 The Brazilian market has moved through resistance but, like the Indian market, is moving weakly sideways. 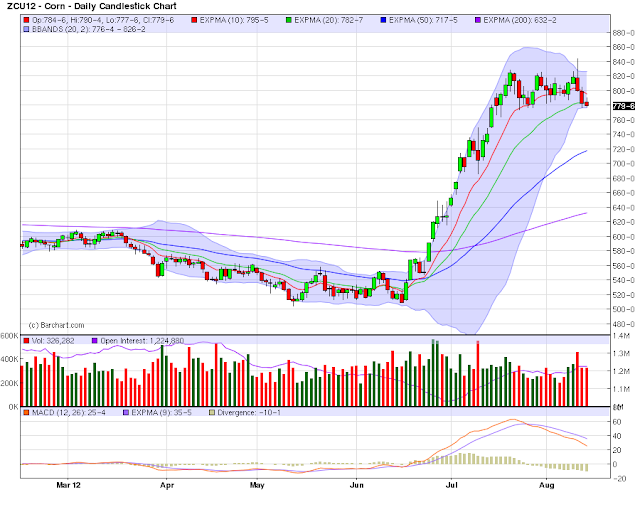 We do see a better EMA picture, with the shorter EMAs rising through the 50 day EMA. Additionally, there is a stronger MACD and CMF picture as well. Copper isn't rallying at all. Instead, we see prices stuck in a range between 42 and 44 for the last three months. All the shorter EMAs have a downward trajectory as does the 200 day EMA. 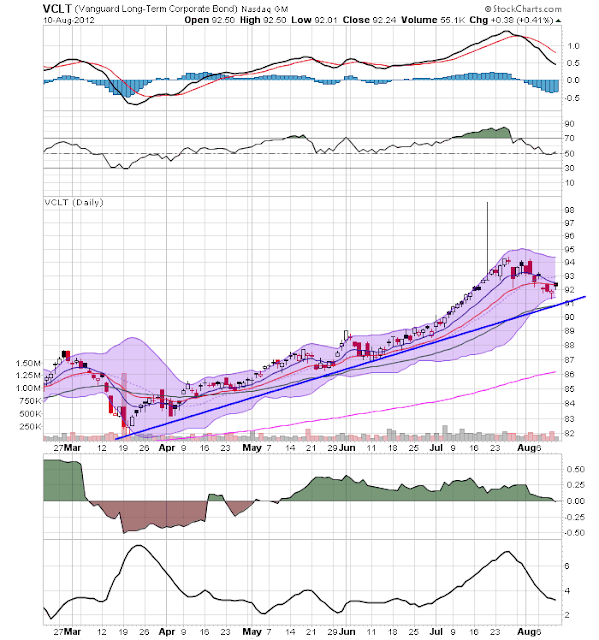 The MACD is weak and the CMF is slightly positive. 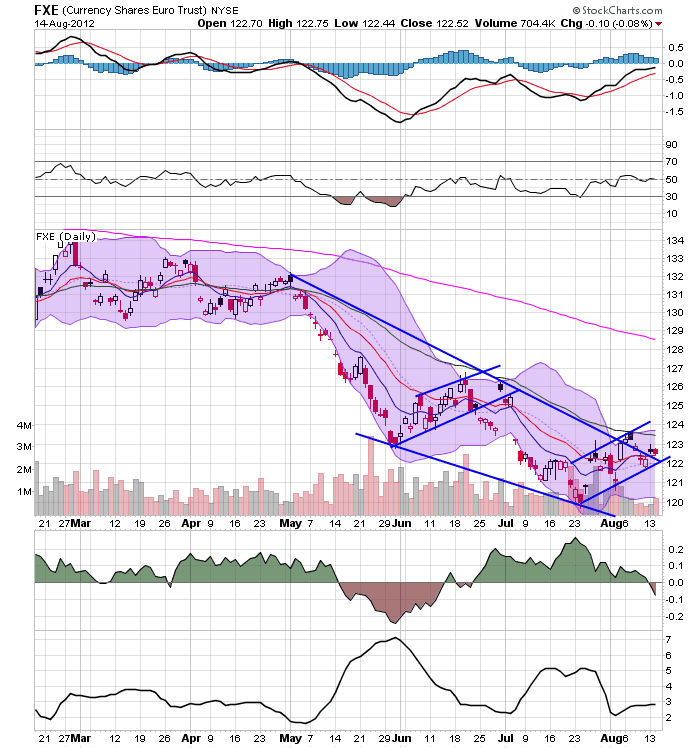 Dr. Copper is not signaling a strong economic environment coming around the bend. 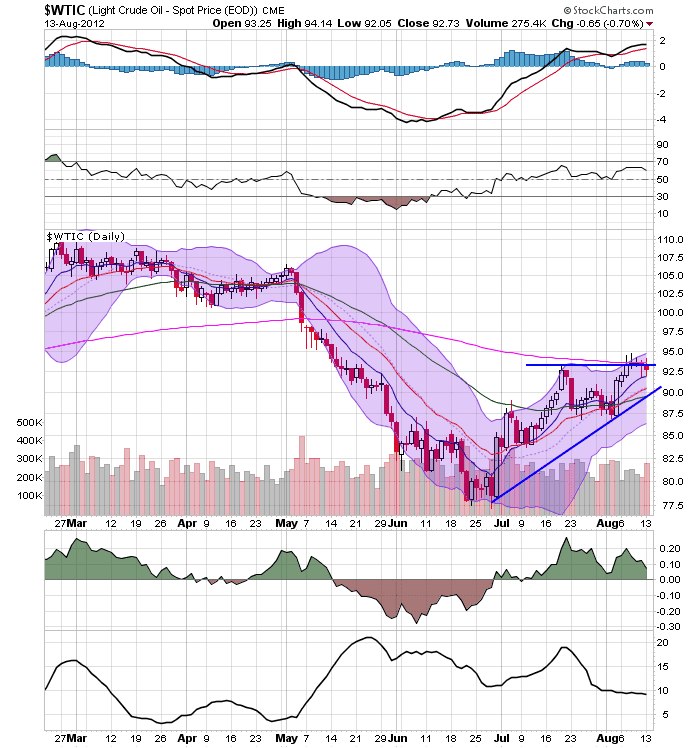 Oil prices are consolidating in an ascending triangle formation, which also uses the 200 day EMA as upside support. Last week, the Washington Post ran an article titled, Economy Might Be Gaining Traction, New Data Suggest. The article highlights recent developments in exports, housing and employment as the reasons for enthusiasm. This week, we'll be looking at some of the points made in the article to see if they're valid. NDD wrote this piece below on employment. Let's take a look at a few updated employment graphs. July was one of the two best months for initial claims since the recovery began 3 years ago (the other was March of this year). But like March of this year, we failed to generate 200,000+ private sector jobs. We need at very least one 200,000+ report to suggest that the prior trend may reassert itself. Morning Market Analysis; Are We Really Breaking Out? 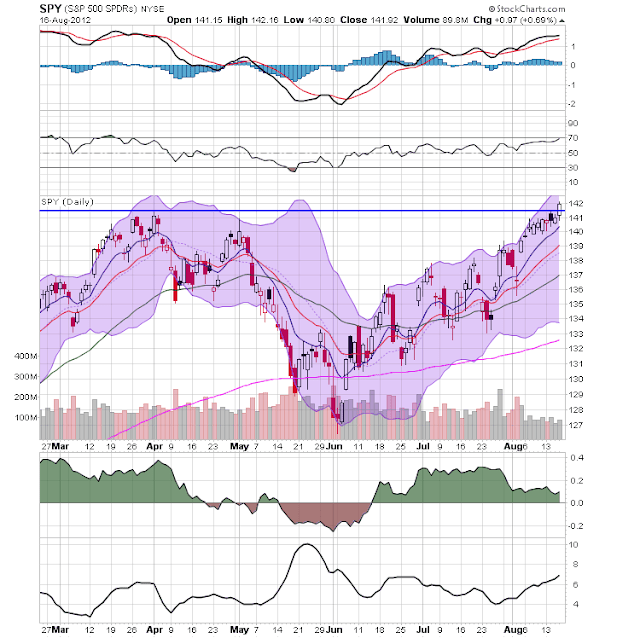 Last week, the big news was the sell-off in the treasury market. I've previously written that so long as the treasury market was rallying, the equity markets would have a difficult time rallying. So, now that we're seeing some flows from the treasury market, let's see if they're moving into the equity market. Prices have moved through resistance at the 130 level and advanced a few more points. 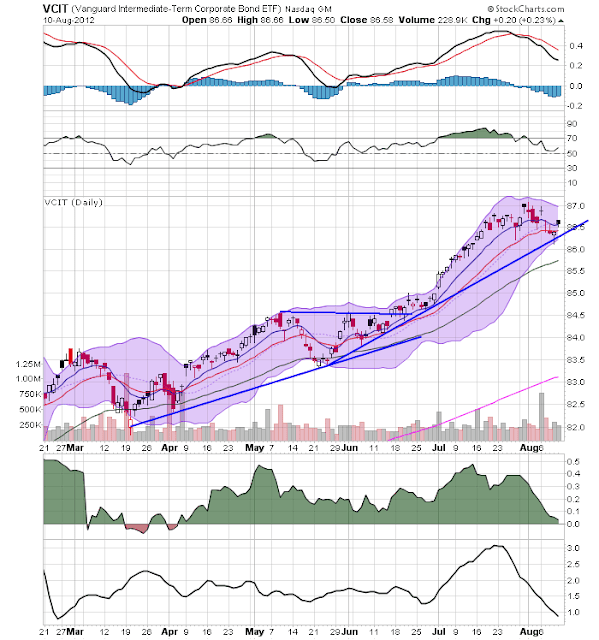 We see a rising EMA picture, money flowing into the market and a rising MACD. Prices are currently at/near 6 month highs. The analysis for the SPYs transfers over to the QQQs, except the QQQs aren't near 6 month highs. The IWMS are flashing a warning. First, while the QQQs and SPYs have rallied, the IWMS have traded in a sideways pattern. 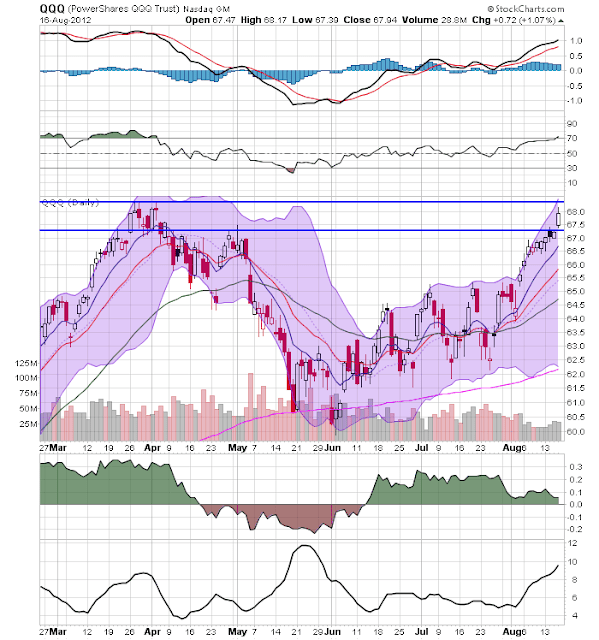 In addition, while prices have moved beyond resistance, we're not seeing a continuation of the rally. 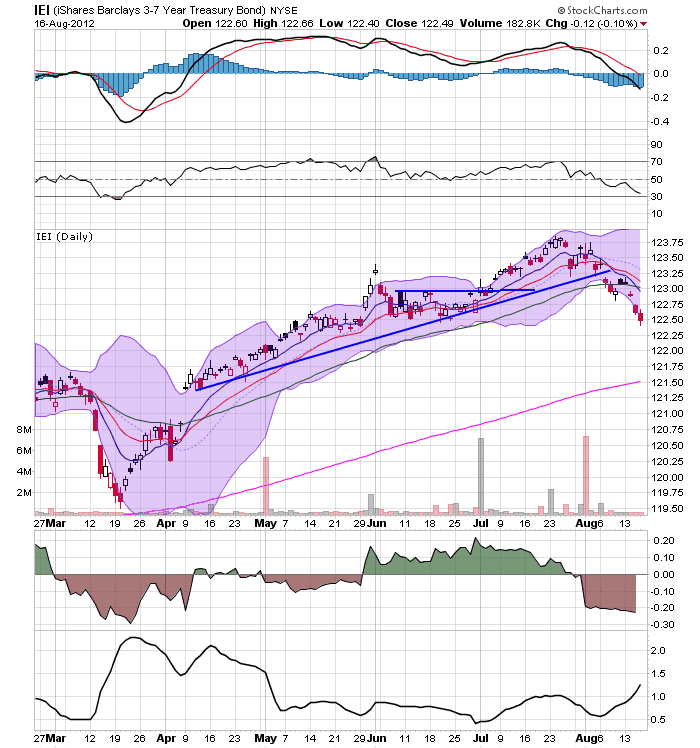 Put another way, the IWMs aren't confirming the QQQs and SPYs move higher. This is concerning as the IWMs represent risk capital and they should be moving higher first if traders are banking on a recovering economy. 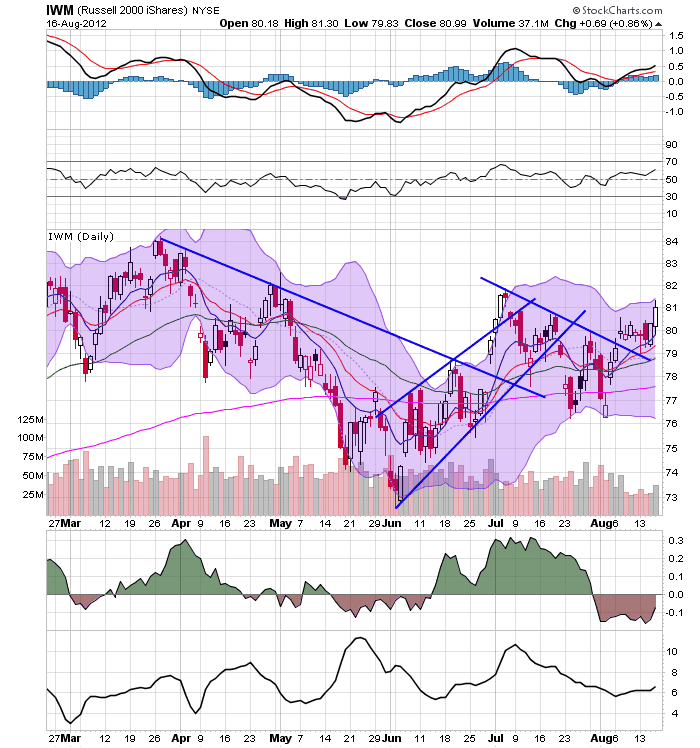 The transports are flashing a BIG warning sign. 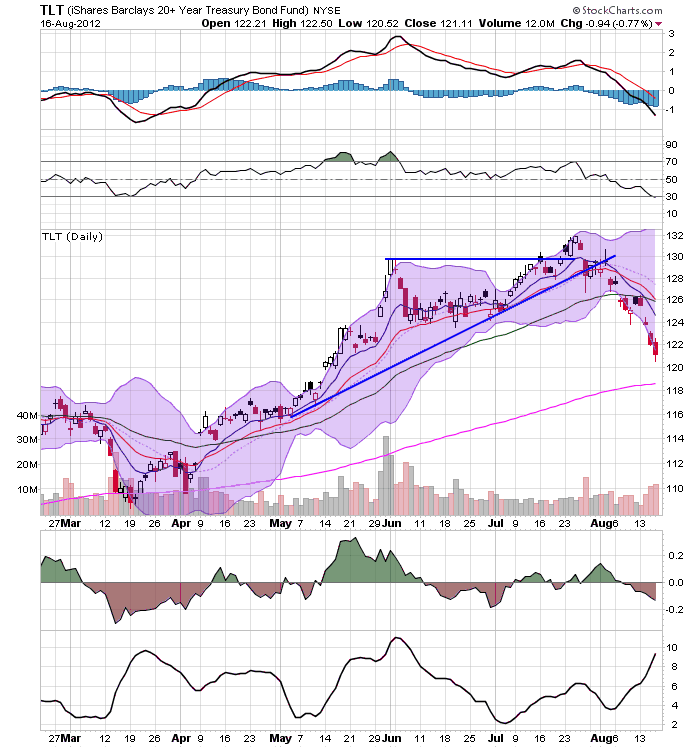 Rather than rallying in conjunction with the other markets, they are moving lower and are having a difficult time getting beyond the 200 day EMA. 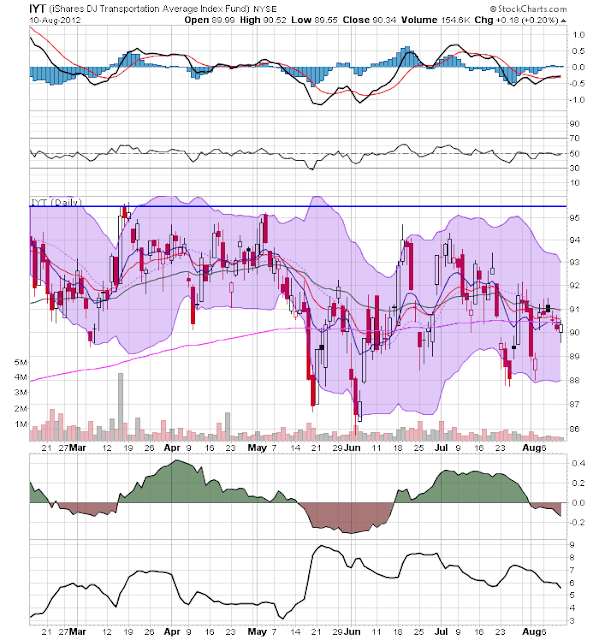 Also note the weak MACD and negative CMF reading. These are not good developments for an overall analysis of a rallying market. The corporate market is selling off, but not to a sharp degree. 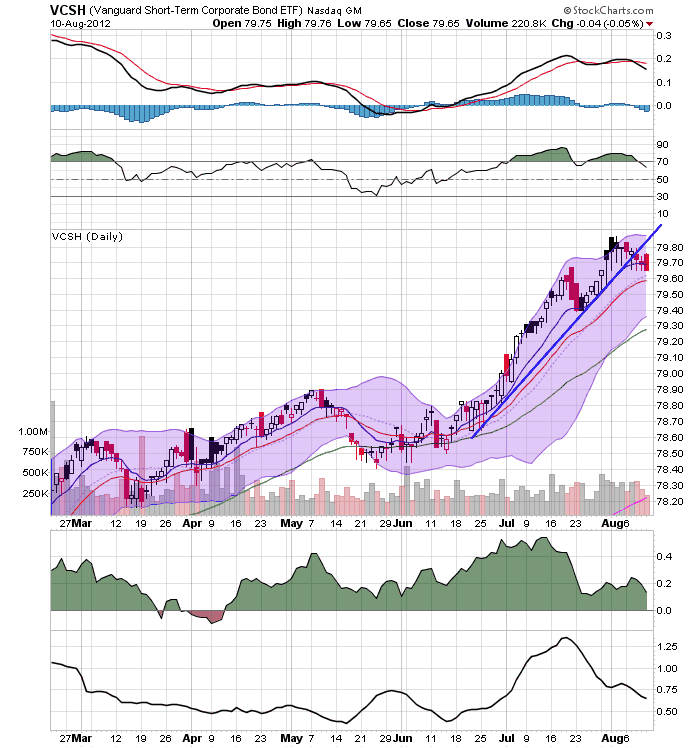 The top chart -- which shows the shorter end of the corporate market -- has broken trend. And the MACD has moved sideways for a few weeks and has also given a sell signal. But prices are still at the 10 day EMA. so there is still a ways to go. The intermediate part of the corporate curve (the middle chart) has two trend lines. While prices are near the first, there is still the second. And the long end of the market (bottom chart) still has support to move through as well. All of these charts do have negative MACD readings, indicating momentum is dropping. And we also see decreased volume flow. But, while we are seeing some downward trends in the corporate market, they are only a few weeks old. Ideally we need for prices to break trend before making a call that money is flowing out of the market.